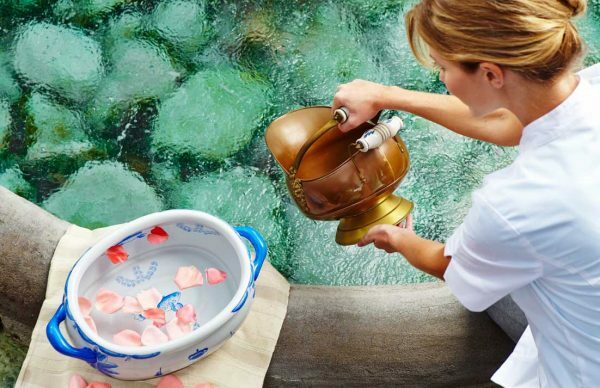 Zdravets Hotel provides special offers tailored to the mineral water characteristics, the personal characteristics and the current health condition of the guests wishing to use balneotherapy and SPA procedures in the hotel. Balneotherapy has a beneficial effect on joints, muscles and peripheral nervous system: disc herniation, radiculitis and plexitis. Underwater jet massage and whirlpool tubs improve emotional tone. Low- and medium-frequency currents are used for treatment after muscle and joint injuries, they disperse oedema and exudates and are used for treatment of neuritis, neuralgia, radiculitis, plexitis, hemiplegia, inflammatory and degenerative diseases of the joints and gynaecological diseases. It is good for peripheral nervous system disorders, musculoskeletal disorders, chronic inflammation processes of various organs, gynaecological diseases. It has an anti-inflammatory analgesic effect in diseases of the bone and joint system, post-facture conditions and diseases of the peripheral nervous system. It has a good effect on adnexitis, endometritis and mastitis. It relieves pain in the muscles and joints, relieves common cold, improves blood circulation and cleanses the body of toxins. It improves wound healing, pain treatment, joint problems, chronic inflammations of different organs and of the peripheral nervous system. It relieves pain in rheumatoid arthritis, reduces numbness of hands and feet, improves the activity of the intestines, melts away fats and has a good effect on cellulite. It helps in the prevention of venous diseases. Thermal mud is rich in biologically active substances with a healing effect. It strengthens the bones, improves the trophic and stimulates the body. Black Sea lye is a highly concentrated solution of different ions which have bioregulatory, anti-inflammatory, antiallergic and other therapeutic effects. Programme for the treatment of the peripheral nervous system. It is intended for patients in remission suffering from herniated disc, radiculitis, plexitis, neuritis, neuralgia and hemiplegia. Programme for arthro-rheumatic diseases. This programme is applied in case of rheumatoid arthritis, Bechterew’s disease and other types of arthritis. Arthrosis Programme. It is offered for rehabilitation and prevention of degenerative joint diseases with involvement of one or more joints including the spine. Osteoporosis Programme. It is intended for the prevention of primary osteoporosis, suitable for women and men wishing to preserve and increase their bone density for women at the age of and after the age of menopause with low bone density and low fracture risk. Antistress Programme. It helps recovery in case of chronic fatigue and extreme mental and physical fatigue. Anti-cellulite programme. Intended for young women in good general condition. It includes consultation with a doctor and preparation of an individual programme. Procedures – tangentor tub, partial anti-cellulite massage of the problem areas, pressotherapy, vacuum massage, sauna. For pure lungs. Inhalations with mineral water and herbs are offered. This relieves congestion in bronchitis, colds and other respiratory and sinus diseases. Conditions after bronchopneumonia. Intended for patients in remission suffering from herniated disc, radiculitis, plexitis, neuritis, neuralgia and hemiplegia. It can be used for cellulite on problem areas in young women. Electrotherapy equipment with different types of low- and medium-frequency currents. It is used for relief of pain in the muscles, prevention or retardation of atrophy. Improvement of blood circulation and increase of the range of motion. It is aimed to achieve electrical nerve stimulation and electrical muscle stimulation of patients in remission suffering from herniated disc, radiculitis, plexitis, neuritis, neuralgia and hemiplegia. In bone and joint diseases: arthritis and arthrosis.